A paved driveway and covered porch welcome you to this bright, comfortable home set on a quiet street ending in a cul-de-sac. 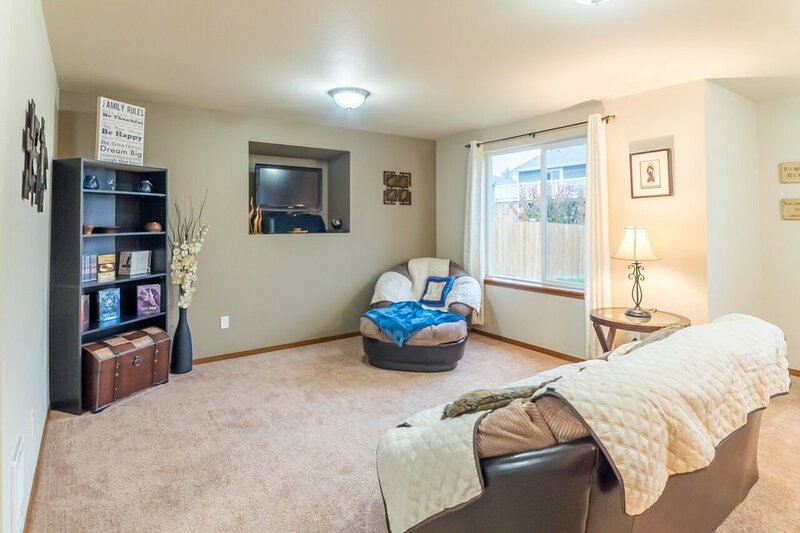 Built in 2011 and refreshed with all new carpet and interior paint; the house is gleaming. Step onto hardwood-style laminate floors with an open staircase leading upwards on one side. The main floor is an open concept living area great for friends and family while the bedrooms are tucked securely upstairs. Covered front porch offers a spot to sit in the shade or shake the rain off before stepping inside. 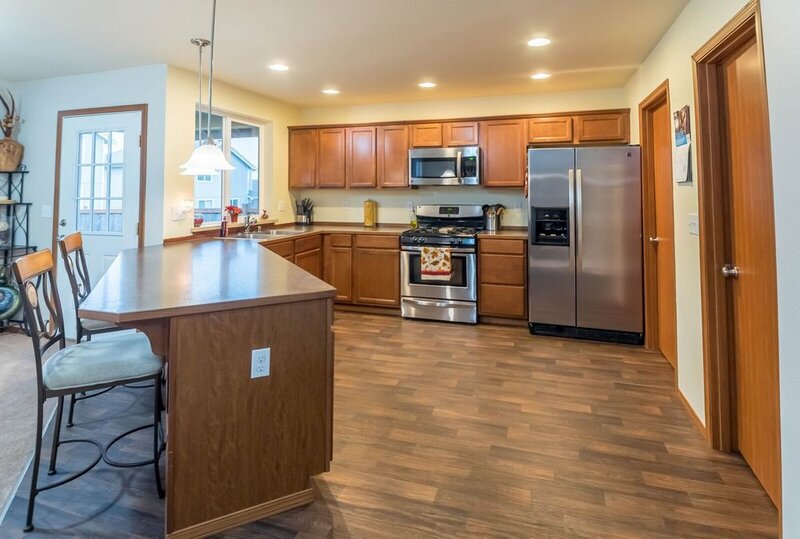 The spacious kitchen features stainless appliances, maple cabinets, and a convenient walk-in pantry, as well as a double sink with a window above allowing for natural light and a backyard view while washing dishes and preparing meals. Pull a stool up to the bar counter for casual meals or to chat with the cook. The kitchen connects to the laundry area too which leads into the double-car garage. The living and dining space present neutral tones to accommodate all kinds of color schemes. A half bath with a pedestal sink completes this cozy and comfortable main floor. Spacious, open-concept kitchen features bar counter, laminate floors, stainless steel appliances, pantry, and double-sink. Also connects to laundry room which leads into the garage. Head up the open staircase lit by a chandelier and little square window to reach the four bedrooms in the home. A carpeted landing connects the bedrooms with a full bath featuring a nice big mirror, and a vanity with counter space. 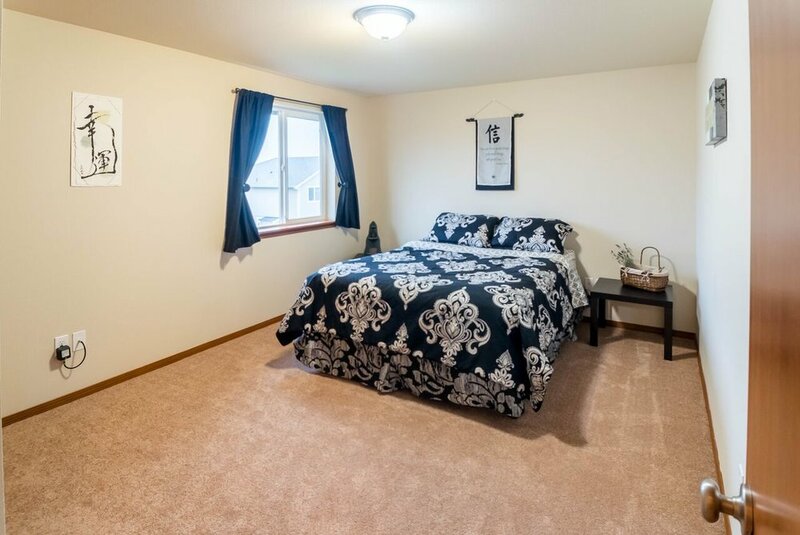 With four bedrooms you might find yourself setting up a pretty guest room, or even establishing an office space. The fourth bedroom and second full bath belong to the master suite. The master bedroom includes a walk-in closet while the master bath includes a bathtub with a bright white tub surround and detachable shower head for handheld or overhead use. The vanity is spacious with a good combination of drawers and cupboards for storage. A wooden fence encompasses the backyard complete with young trees for shade, an open lawn for sunshine and play, and a covered patio. Aerial front view gives a glimpse of the fully fenced backyard and neighboring homes. 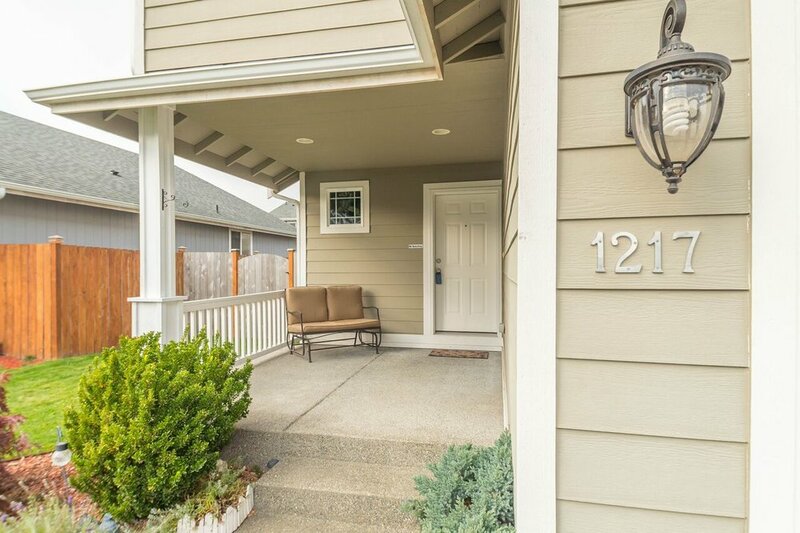 You'll find this home in Tacoma's Eastside, just a 7 minute drive to downtown Tacoma's museums such as the Children's Museum, as well as coffee shops, restaurants, and UW Tacoma. It's easy to hop on I-5 from this neighborhood, or stick closer to home with a visit to the Mottet Library, your local branch, just a 5 minute drive away. Other neighborhood features are the Portland Avenue Community Center, and the Portland Avenue Nursery which is fun to explore whether you're ready to landscape your whole yard, or just want to pick out a few annuals for the front flowerbed. And don't forget the Lincoln International District down the road, as well as the Tacoma Mall just 12 minutes away. Dining area connects to kitchen and living space and has access to the backyard. Living room is conveniently open to dining area and kitchen. Brand new carpets and paint throughout the whole house! Open staircase lit by chandelier leads from front entrance to upstairs landing, bedrooms, and bathrooms. Master bedroom with walk-in closet. Connects to master bath. Master bathroom with tub surround, vinyl floor, and large vanity with drawers and cupboards for great storage. Upstairs bedroom complete with the new carpet found through the home, and access to the upstairs landing. This is the 4th upstairs bedroom. It could also be used as an office, den, or playroom. You pick! Full bathroom with tub surround, vinyl floors, big mirror, and vanity with good storage options. Covered patio with entry to living/dining room. A great place for some fresh air, or a morning cup of tea or coffee on a nice day. Backyard is fully fenced and provides plenty of lawn space, some young trees, and a covered patio area.